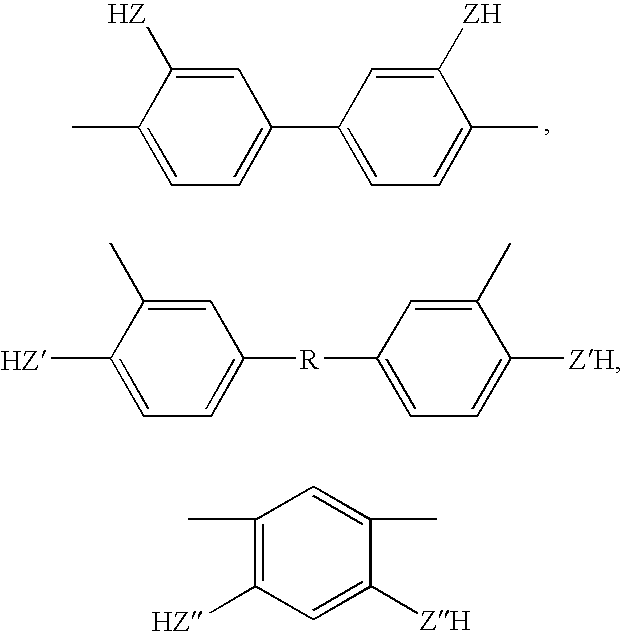 Some of the preferred polyimide polymers that are used for the preparation of high performance cross-linked polybenzoxazole and polybenzothiazole membranes in the present invention include, but are not limited to, poly[3,3′,4,4′-benzophenonetetracarboxylic dianhydride-2,2-bis(3-amino-4-hydroxyphenyl)-hexafluoropropane] (poly(BTDA-APAF)), poly[4,4′-oxydiphthalic anhydride-2,2-bis(3-amino-4-hydroxyphenyl)-hexafluoropropane] (poly(ODPA-APAF)), poly(3,3′,4,4′-benzophenonetetracarboxylic dianhydride-3,3′-dihydroxy-4,4′-diamino-biphenyl) (poly(BTDA-HAB)), poly[3,3′,4,4′-diphenylsulfone tetracarboxylic dianhydride-2,2-bis(3-amino-4-hydroxyphenyl)-hexafluoropropane] (poly(DSDA-APAF)), poly(3,3′,4,4′-diphenylsulfone tetracarboxylic dianhydride-2,2-bis(3-amino-4-hydroxyphenyl)-hexafluoropropane-3,3′-dihydroxy-4,4′-diamino-biphenyl) (poly(DSDA-APAF-HAB)), poly[2,2′-bis-(3,4-dicarboxyphenyl)hexafluoropropane dianhydride-3,3′,4,4′-benzophenonetetracarboxylic dianhydride-2,2-bis(3-amino-4-hydroxyphenyl)-hexafluoropropane] (poly(6FDA-BTDA-APAF)), poly[4,4′-oxydiphthalic anhydride-2,2-bis(3-amino-4-hydroxyphenyl)-hexafluoropropane-3,3′-dihydroxy-4,4′-diamino-biphenyl] (poly(ODPA-APAF-HAB)), poly[3,3′,4,4′-benzophenonetetracarboxylic dianhydride-2,2-bis(3 -amino-4-hydroxyphenyl)-hexafluoropropane-3,3′-dihydroxy-4,4′-diamino-biphenyl] (poly(BTDA-APAF-HAB)), and poly(4,4′-bisphenol A dianhydride-3,3′,4,4′-benzophenonetetracarboxylic dianhydride-2,2-bis(3-amino-4-hydroxyphenyl)-hexafluoropropane] (poly(BPADA-BTDA-APAF)). 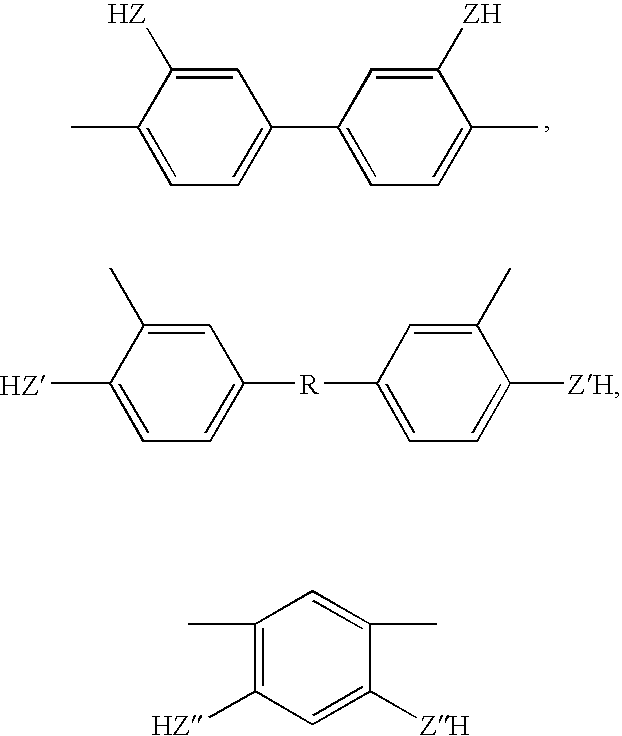 The polyimides comprising UV cross-linkable functional groups and pendent functional groups (e.g., —OH or —SH) ortho to the heterocyclic imide nitrogen in the polymer backbone that are used for the preparation of the cross-linked polybenzoxazole and polybenzothiazole polymer membranes in the present invention are synthesized from diamines and dianhydrides in polar solvents such as 1-methyl-2-pyrrolidione (NMP) or N,N-dimethylacetamide (DMAc) by a two-step process involving the formation of the poly(amic acid)s followed by a solution imidization or a thermal imidization. 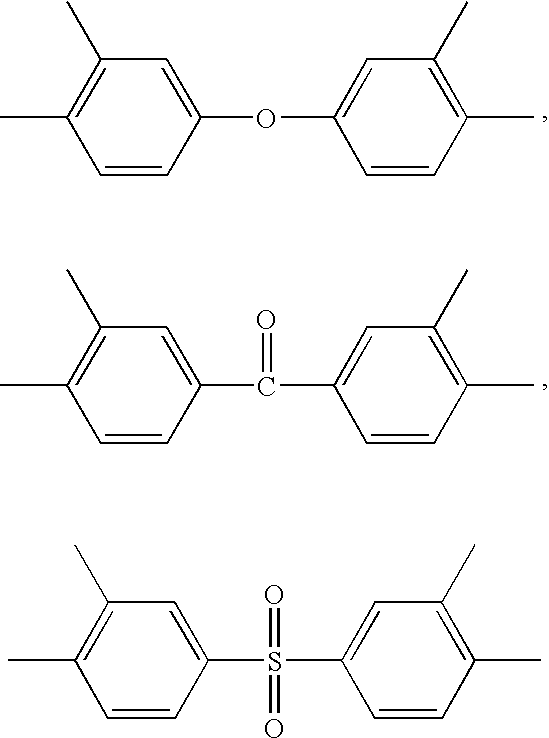 Acetic anhydride is used as the dehydrating agent and pyridine (or triethylamine) is used as the imidization catalyst for the solution imidization reaction. 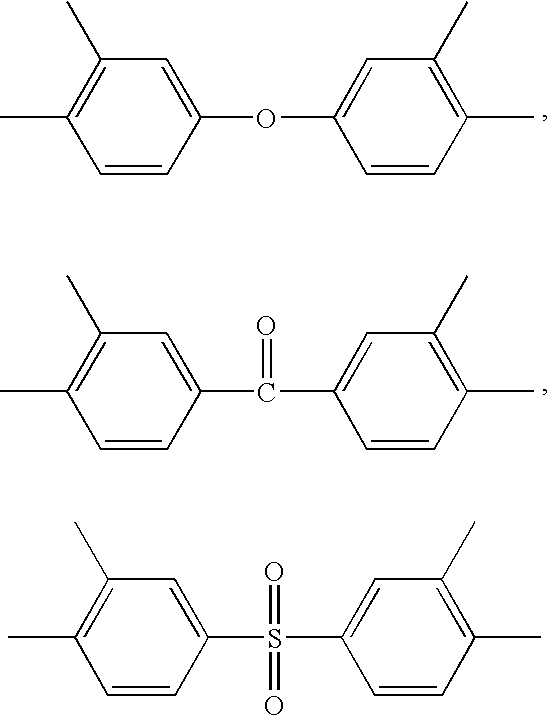 More information regarding the preparation of these polymers can be found in Tullos et al, MACROMOLECULES, 32, 3598 (1999). 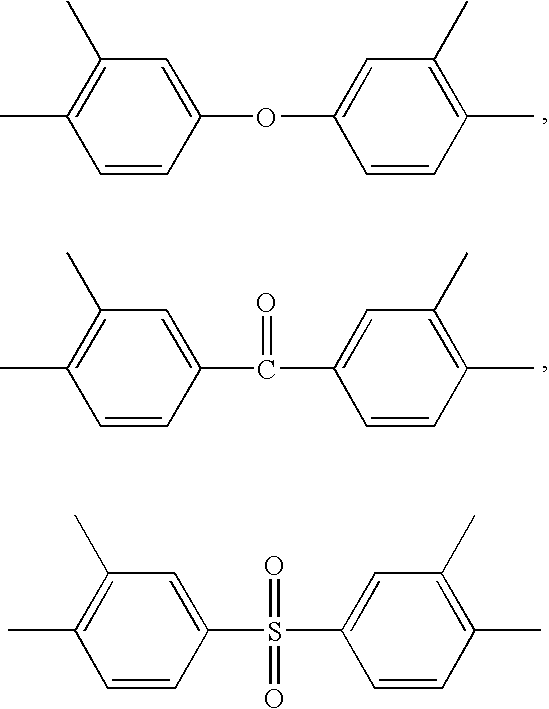 In some cases a membrane post-treatment step can be added after the formation of the cross-linked polybenzoxazole or polybenzothiazole polymer membrane with the application of a thin layer of a high permeability material such as a polysiloxane, a fluoro-polymer, a thermally curable silicone rubber, or a UV radiation curable epoxy silicone. The coating filling the surface pores and other imperfections comprising voids (see U.S. Pat. Nos. 4,230,463; 4,877,528; 6,368,382). Comparable Examples 1, 2, and 3 assumed a natural gas feed with 8% CO2, and the product spec for CO2 is at 2%. In Comparable Example 1, the commercially available membrane was assumed to be a membrane with typical performance in the current natural gas upgrading market. In Comparable Examples 2 and 3, the cross-linked PBO(BTDA-APAF-450C) (shown in Table 1) material was used to make the membrane with a thickness of 200 nm. The permeance of the new high gas permeability cross-linked PBO(BTDA-APAF-450C) polymer membrane was assumed at 0.030 m3(STP)/m2.h.kPa at 50° C. and 0.044 m3(STP)/m2.h.kPa at 100° C. based on the permeability measured for the dense membrane, and the selectivities were assumed at 44 at 50° C. and 15 at 100° C., which are lower than the selectivities shown in Table 1. A process simulation based on the above performance was performed for Comparable Examples 1, 2 and 3. The results are shown in Table 6. 2. 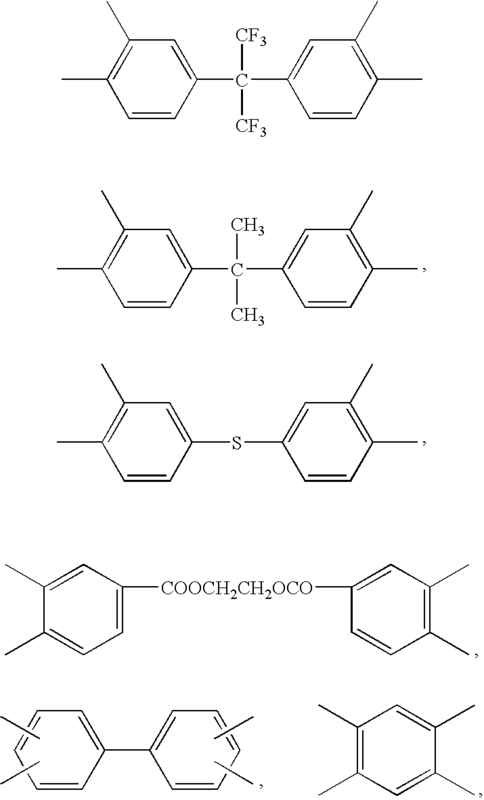 The process for separating at least one gas or liquid from a mixture of gases or liquids of claim 1 wherein said gases are mixtures selected from the group consisting of CO2/CH4, CO2/N2, H2/CH4, O2/N2, H2S/CH4, olefin/paraffin, and iso paraffins/normal paraffins. 3. The process of claim 1 wherein said gas or liquid comprises at least one volatile organic compound in an atmospheric gas. 4. The process of claim 1 wherein said gases or liquids comprise a mixture of hydrogen, nitrogen, methane and argon in an ammonia purge stream. 5. The process of claim 1 wherein said gases or liquids comprise hydrogen from a hydrocarbon vapor stream. 6. The process of claim 1 wherein said gases or liquids comprise a mixture of at least one pair of gases selected from the group consisting of nitrogen and oxygen, carbon dioxide and methane, and hydrogen and methane or a mixture of carbon monoxide, helium and methane. 7. The process of claim 1 wherein said gases or liquids comprise natural gas comprising methane and at least one gas component selected from the group consisting of carbon dioxide, oxygen, nitrogen, water vapor, hydrogen sulfide, helium and other trace gases. 8. The process of claim 1 wherein said gases or liquids comprise hydrocarbon gases, carbon dioxide, hydrogen sulfide and mixtures thereof. 9. The process of claim 1 wherein said gases or liquids comprise a mixture of organic molecules and water. 10. 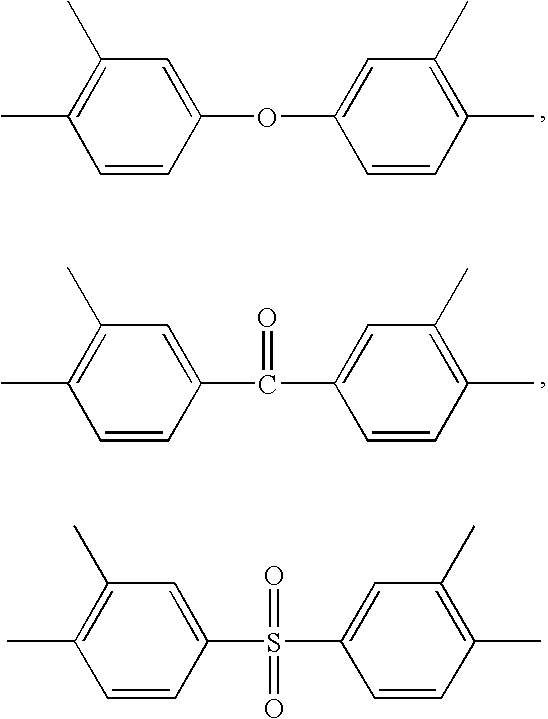 The process of claim 1 wherein said cross-linked polybenzoxazole or polybenzothiazole polymer membrane is used at a temperature from about −50° C. to 100° C.
11. 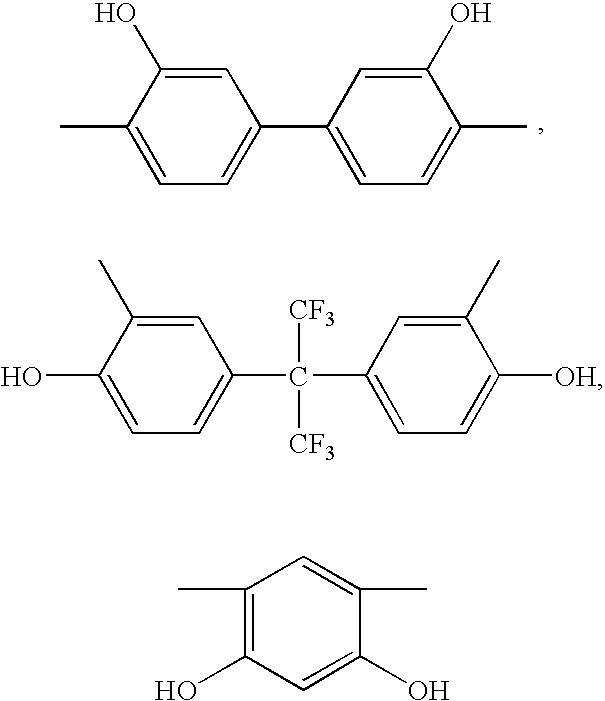 The process of claim 1 wherein said cross-linked polybenzoxazole or polybenzothiazole is used at a temperature from about 20° C.-70° C.
13. 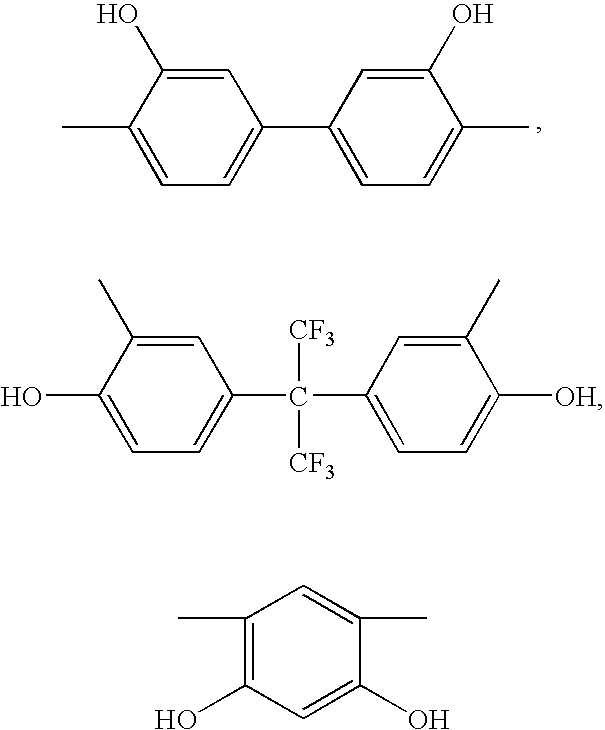 The process of claim 12 wherein said organic compound is selected from the group consisting of alcohols, phenols, chlorinated hydrocarbons, pyridines and ketones. 14. The process of claim 12 wherein said liquid mixture comprises a mixture of sulfur compounds with gasoline or diesel fuels. 15. 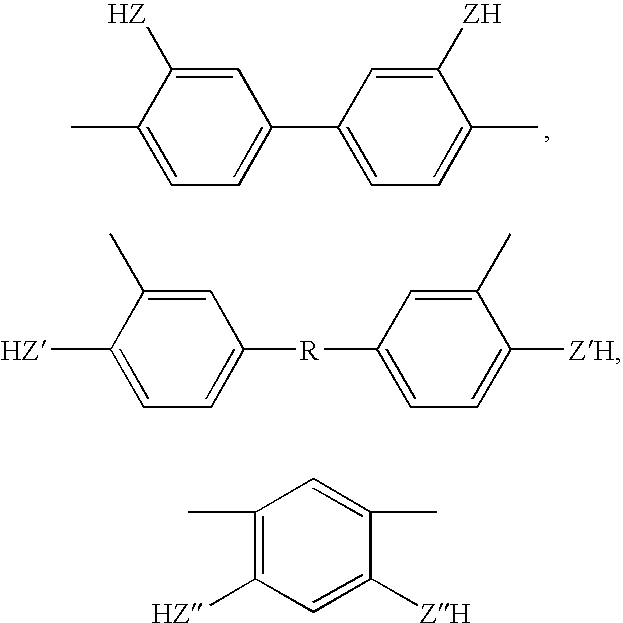 The process of claim 12 wherein said liquid mixture comprises a mixture selected from the group consisting of ethylacetate-ethanol, diethylether-ethanol, acetic acid-ethanol, benzene-ethanol, chloroform-ethanol, chloroform-methanol, acetone-isopropylether, allylalcohol-allylether, allylalcohol-cyclohexane, butanol-butylacetate, butanol-1-butylether, ethanol-ethylbutylether, propylacetate-propanol, isopropylether-isopropanol, methanol-ethanol-isopropanol, and ethylacetate-ethanol-acetic acid. Dybtsev, Danil N. et al., Rigid and Flexible: A Highly Porous Metal0Organic Framework with Unusual Guest-Dependent Dynamic Behavior, Angew. Chem. Int. Ed., 43: 5033 (2004). U.S. Appl. No. 12/412,629, filed Mar. 27, 2009, Liu et al. U.S. Appl. No. 12/412,639, filed Mar. 27, 2009, Liu et al. U.S. Appl. No. 12/412,653, filed Mar. 27, 2009, Liu et al. U.S. Appl. No. 13/165,939 filed Jun. 22, 2011, Liu et al.